A 22-year-old Indian man named Suraj Mahto who left his wife, Lalita for his 42-year-old mother-in-law, Asha Devi is now seeking a divorce after realising he made a huge mistake. 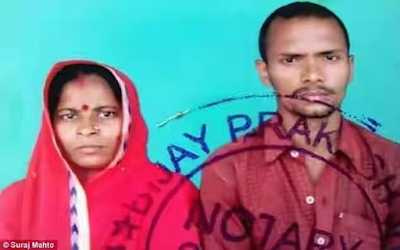 It all began when Mrs Devi went to stay with her daughter and her son-in-law in Bahir, she took on the role of caregiver when Mahto fell ill and the two hit it off from there. When she returned to her house, they still kept in touch, he wouldcall her and they would talk for hours on the phone, he also visited her at her home. Lalita got to know of the affair and told her mother to stay away but she was too besotted with her son-in-law and refused. Even her husband could make her see reason. Eventually, despite the objections of villagers, the couple eloped and married on June 1 this year. The union has proved to be a very brief one, two months after tying the knot, the unusual couple are back and pleading for forgiveness. He said he would go on bended knee and beg Lalita to have him back. The couple have a son together.